Our last speaker of the day will be lecturing on banned speech, banned evidence and even a ban on legal defence in court. On top of everything else, being banned from defending yourself in court constitutes a particularly disturbing problem. This speaker is a fully qualified lawyer and throughout her lecture I find it of particular importance, that we don’t let our judgement be influenced by what our eyes and ears have already been shown or told. She really made the headlines a few years ago, as a defense attorney. So let me briefly explain with whom we are dealing with. This defense attorney has the courage of the lion. She is stronger than a man, and I have never met a woman with such a profile. 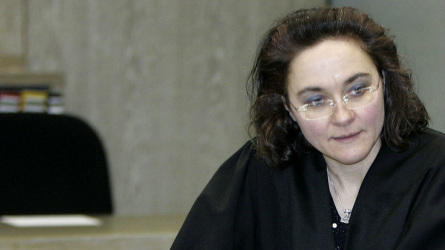 She bravely stood up and took it upon herself to defend Ernst Zündel in the famous case against him, for so-called ‘holocaust denial’ She was the trial lawyer of Ernst Zündel During the legal proceedings she provided evidence to the court, which could raise doubts regarding the official account of history. This caused furor in the courtroom. And she was prohibited from speaking any further. This speech-ban was ordered as she was presenting the arguments of the defendant. She was not allowed to argue the case, and barred from listing more evidence. She ignored the speech-ban and continued to submit evidence. And was then threatened on pain of penalties if she persisted. As it became too much for the authorities, she was arrested right there in the courtroom during her defence of the so-called ‘holocaust denier’ Ernst Zündel. But not even this could silence her, as she continued to speak the case of her defendant while being forcefully removed from the courtroom. For this she was imprisoned for almost three and a half years, in spite of her having no previous convictions. Arrested in the courtroom and directly into prison. On top of this, she had to face 5 years of ‘berufsverbot’ through cancellation of her license to work as an attorney, and was removed from the Association for German Lawyers. They threw her out, but we would like to carry her into our midst. I urge you to help her along. We are talking about a legend here. Making headlines across Europe. Welcome Sylvia Stolz. If they won’t let you speak there, we will let you speak here. We trust you to know the limitations. I am sure you do. Thank you for the warm welcome. Ladies and Gentlemen, dear friends. I’ll say it again, thank you for the warm welcome. I would like to begin my presentation with one sentence, with which I also intend to end it. I believe that in this sentence, the very essence of being human is unfolded. ‘To think what is true, to sense what is beautiful and to want what is good, hereby the spirit finds the purpose of a life in reason’ This is a quote from Johann Gottfried von Herder ‘To think what is true, to sense what is beautiful and to want what is good. Regardless of your religion, your world-view or philosophical orientation this sentence encapsulates the essence of human life, in my opinion. The alpha and omega. One of the important topics we will be discussing, is ‘Freedom of speech’ One hears from many places, that people who have certain opinions get into trouble. And this is not confined to political discourse. I am sure you know of quite a few areas, without me listing them. But to give an example, say, the issue of vaccines. There are doctors out there, who have been banned from practicing, because they warned against vaccination. This i just one example out of many within medicine. Or journalists who are ostracized because they have a differing view of the events of 9/11 2001 and report on this. Such journalists are also bound to get in trouble. However, these people are not punished by criminal law, but find themselves punished in their respective occupations. These examples should suffice to show, that the highly praised ‘Freedom of Speech” in reality isn’t all, that it is made out to be. And now to the issue of banned evidence, banned legal defence within the area of ‘holocaust denial’ Much could be said about this, one hour is far from sufficient. My job here is to omit that, for which there is no time. But there are certain points, which I think are essential to emphasize. First of all, it must be said, that the principle of the ‘defined penal code’ has not been fulfilled. It has been downright violated. This principle dictates, that the accused, must be allowed to know, what he did wrong. And what he should have done otherwise If someone takes a bicycle, that does not belong to him, then this of course constitutes ‘theft’,as we all know. In cases of libel, where a person says something negative, causing reputational damage, then the question of the court is, whether or not, what was said is true or false. And if true, it does not constitute ‘libel’, because in theory one is allowed to speak the truth. In the case of ‘holocaust denial’ the first problem we are faced with is that the holocaust isn’t defined anywhere. That is the problem of a ‘defined penalcode’ An authoritative definition cannot be found anywhere. I’ll get back to this later. Let’s turn to to the legal passages. First of all the ones within German Law In paragraph 130 section 3 according to which so-called ‘holocaust deniers’ are fined or imprisoned up to 5 years for each singular offence. In this paragraph there is no mention of the holocaust itself. It os not defined in the law as such. Instead it refers to paragraph 6 section 1 of international law. And here we find a definition of ‘genocide’. And whoever denies that such a ‘genocide’ has occurred, commits an offence, provided that additional criteria are met, such as disturbance of the public order’ But what I would like to emphasize is the definition of ‘genocide’ in paragraph 6. It is very brief. I’ll give an excerpt. It is defined as ‘genocide’ when ‘ONE member’ of an ethnic, religious or other group is ‘killed with the intention of causing ‘the deliberate and systematic destruction, in whole or in part, of an ethnic, racial, religious or national group’ This means that if just one member of say, a religious group is killed, and the perpetrator intended to kill a part of or the whole group. Then it constitutes ‘genocide’, according to this definition. Let us now turn to the question of how it should be defined in order to clear. Normally in cases of murder, a verdict contains the established facts of the police investigation, such as where and when , which weapon was involved, the name of the perpetrators and so on. All this is included in the judgment, after being demonstrated by the prosecution that, say ‘this was the murder weapon’ because it carries the fingerprints of the perpetrator and so on. These things must be stated in the judgment. In cases of ‘holocaust denial’, we are dealing with a criminal denial of murder, and then of course we would expect to find the details of that murder spelled out too. Otherwise we have no idea, what the accused actually denied. This is the problem, there is no clarity when it comes to what was denied specifically. There should be atleast one case against a holocaust denier in which the specifics of the related crime have been demonstrated and specified. I know of no such verdict. There are no details concerning the crime-scenes, the method of killing, the number of victims, the time-frame of the killings, the perpetrators, the corpses. We have no physical trace of a killing. The testimonies are not specified, neither are the documents or similar kinds of evidence. The intention to destroy all or part of jewry under national-socialist rule has not been demonstrated anywhere. There are no documents showing any prior decisions, plans or orders. When it comes to the trial of holocaust deniers, we do not find these things specified. Neither do we find any references to other verdicts, in which all these things could have been stated. This is the problem. As long as the court will not commit to certain specified crime-scenes on which these mass-killings are supposed to have happened As long as the court will not commit to atleast one specified piece of evidence As long as this remains the case, these mass-killings simply cannot be demonstrated. And even less so the ‘denial’ of said mass-killings. Now some people might say, ‘What about the Nuremberg-trial? ‘it’s probably in there somewhere, the details?’. This is not the case. Let me read you the relevant passage of the Nuremberg verdict, where gas-chambers are mentioned. Here it says and I quote ‘A certain number of the concentration camps were equipped with gas chambers for the wholesale destruction of the inmates, and with furnaces for the burning of the bodies. Some of them were in fact used for the extermination of Jews as part of the ‘final solution’ of the Jewish problem. Most of the non-Jewish inmates were used for labor, although the conditions under which they worked made labor and death almost synonymous terms. Those inmates who became ill and were unable to work were either destroyed in the gas chambers or sent to special infirmaries, where they were given entirely inadequate medical treatment, worse food if possible than the working inmates, and left to die.” That is all it says about gas-chambers in the Nuremberg verdicts. It is all stated in general terms such as ‘a certain number of concentration camps’. It is not mentioned where the gas-chambers were. This means that a defense attorney is left with no place to begin. It is also important to emphasize that the rules of evidence where nullified in the Nuremberg trials. Very important parts of them atleast. It says here, in the London statutes which were written specificalle for this military tribunal. Here in Article 19 it says. ‘The Tribunal shall not be bound by rules of evidence’ . That is a sentence which is worth pondering. That a military tribunal, from its inception is given a free hand when it comes to rules of evidence. And furthermore in article 21 ‘The Tribunal shall not require proof of facts of common knowledge, but shall take judicial notice thereof ‘. Interesting, right? It shall not require proof of facts of common knowledge, but what are ‘facts of common knowledge’. It is usually the job of the courts to establish the facts, not presume the facts. It all becomes somewhat clearer in the words of the american chief prosecutor Robert H. Jackson. He stated in the Nuremberg protocols vol. 19 p. 440: ‘As a military tribunal, this Tribunal is a continuation of the war effort of the Allied nations ‘ I’ll repeat, the Nuremberg tribunal is ‘a continuation of the war-effort of the Allied nations’ Does a nation engaged in a war-effort need rules of evidence, as it seeks to burden its opponent with guilt? This is the starting point of a trial for holocaust denial, and it is also the end-point of a trial for holocaust denial, because nothing ever changes. One never gets to know, neither as defence attorney nor as prosecutor what actually has been established as fact. One cannot know from the prior verdicts, old of new. Surely there is a lot in the media and much can be read in books about it, but obviously, we need to hear what has been determined by the courts. We want to know. At this point I would like to add a very telling statement by 34 french historians. In 1979 these 34 historians issued a statement in response to the technical evidence presented by revisionist historian Robert Faurisson who sought to disprove the existence of gas-chambers. These 34 historians all hold to the official accont of the holocaust and put forward the following as a counter-argument to Robert Faurissons line of reasoning. I quote: ‘It must not be asked how, technically, such a mass murder was possible. It was technically possible because it happened. That is the required point of departure of any historical inquiry on this subject. It is incumbent upon us to simply state this truth: there is not, there cannot be, any debate about the existence of the gas chambers.’ end quote This also belongs to the point of departure of a trial for holocaust denial, because this is how the judges, the prosecutors etc. are behaving. Through their actions they are clearly letting you know, that you are not allowed to ask This has had immense consequenses. I am in no way the first lawyer to be punished for ‘holocaust denial’. Not by a long shot. I might be the first lawyer to be imprisoned for it though. But for years lawyers have been accused of holocaust denial, because they submitted evidence regarding details of the holocaust. When submitting evidence, one neccesarily have to phrase it as statements of facts. Otherwise it will not constitute evidence, and will be dismissed. That means you have to claim as fact, that which you want to demonstrate to the court. Otherwise it is not valid, and can be dismissed on formal grounds. But when submitting evidence on behalf of a holocaust denier, asking the court to establish that ‘so-and-so is the case, by expert testimony or in accordance with earlier reports’ etc. Then the evidence is not admitted by the court, and the lawyer is then accused and sentenced for holocaust denial. The general public know very little of this, because the lawyer in question seldom wishes to attract any attention. They simply pay the fine, and tell themselves that they will stay out of trouble in the future. There are a great many cases like this. But I thought to myself, why should this remain unknown to the public. The way the accused are being treated, the way justice is miscarried. To punish lawyers simply for doing their job. I felt it was important to me, that the public get to feel this too I will now turn to the Bavarian court for prosecution of attorneys, who was to decide whether or not I should lose my license. Here again i submitted evidence regarding the presupposed ‘obviousness’ of the holocaust. In other words, if you want to know why you are being punished, then you should go and look it up in the newspapers. It will not appear in the judgment. ‘Go look it up in the ‘Bild-zeitung’ (german tabloid)’ This is of course an important point they have, about ‘the newspapers’. What does the newspapers say? A french historian Jacques Beynac ,was quotet in Le Nouveau Quotidien de Lausanne, a swiss newspaper in september 1996. He said: ‘When it comes to the existence of nazi gas-chambers, all one can do is, to point out the absence of documents, of physical traces and similar types of material evidence’ according to him ‘all one can do is, to point out the absence of documents, physical traces and similar types of material evidence’ This is the opinion of a french historian, who by the way supports the official account of the holocaust. Does this not show that the ‘obviousness’ could and should be questioned in court? Another historian, Ernst Nolte wrote in his book ‘ The Causal Nexus’ ‘The witness testimonies are for the most part based on hear-say and assumptions. The few eye-witness testimonies we have, are in partial contradiction with one another, and raises questions regarding overall credibility’ The historian Hans Mommsen was quoted in the ‘Süddeutsche Zeitung’,saying ‘The holocaust was not ordered by Hitler’ Again statements showing that questions regarding the ‘obviousness’ of the holocaust are valid. The last statement I would like to read to you is from Fritjof Meyer. In the jounal ‘Osteuropa’ he had an article entitled ‘ The number of Auschwitz Victims. New insights from newfound archival documents’ He wrote the the following with regard to the crime-scene. He is editor at ‘Der Spiegel’ by the way… In may of 2002 this journal came out in which he states that the genocide did not happen within in the concentration camp Auschwitz. Instead the genocide happened: ‘in the two farmhouses outside of the camp, probably’… so the genocide did not happen inside the camp, but ‘probably’ in two farmhouses outside of the camp? Again this shows, that evidence concerning the ‘obviousness’ of the holocaust should be allowed in court Now, let us see where the supreme court stand with regard to the criminalisation of holocaust denial. Because the law here prohibits a specific kind of speech it is regarded as a ‘special statute’ within the law. This special statute is acknowledged as ‘unconstitutional’, by the supreme court, because it goes against the constitutionally guarenteed ‘freedom of speech’. This was determined by the supreme court in a rather recent decision from 2009. The official acknowledment of paragraph 130 as a ‘special statute’ is a small step forward. If they would just take the consequence and repeal the law criminalising holocaust denial due to its unconstitutionality… However, I will not spare you their reasons for not doing so. The justifications given by the supreme court for upholding the special statute. In the so-called Wunsiedel-decision of the supreme court of 2009, the court declared that Germany is by way of exception allowed to keep special statutes such as paragraph 130 That is the statute criminalising one particular kind of speech, with the inherent criminalisation of evidence and legal defense… Germany is by exception allowed to keep this special statute because of ‘the unique historical identity of the Federal Republic of Germany shaped through contrast to national-socialism’ In other words, they are allowed to keep the exceptions to free speech, because it is the ‘Federal Republic of Germany’? This is very well put. It brings out the arbitrariness rather well. The second justification is not stated as clearly and is found elsewhere in this supreme court decision. Here they speak of ‘unique’ crimes and seem to suggest that, because we are dealing with this ‘unique’ crime, then by way of exception demonstration of evidence is both superfluous and criminal Giving evidence is both superfluous and criminal, when dealing with a ‘unique’ crime. Does this seem logical to you? At the end of the day, these are the two pillars upon which the criminalisation of holocaust denial rests. It is the justification within legal-theory, so to speak. ‘the unique historical identity of the Federal Republic of Germany’ and the ‘unique crime’ itself, are the reasons given for not allowing the demonstration of evidence. Revisions and constitutional complaints are regularly dismissed as ‘obviously unjustified’ Which again entails, that their decisions need no justification. When something is ‘obviously unjustified’ it of course needs no justification… How neat, that is. Again the answer is not given with regard to questions such as ‘what are we allowed to say, then’? There is no answer. I heard the following statement by judge Meinerzhagen myself in court, during the trial of Ernst Zündel. But if I had simply told you, you would probably not believe me. And it is of course not stated in the transcripts. However the ‘Berliner Tageszeitung’ (Berlin Daily) the socalled ‘TAZ’ had the honor of reporting this statement by Judge Meinerzhagen. I now quote the Berlin daily newspaper ‘TAZ’ from 9. of february 2007 reporting on the trial against Ernst Zündel ‘Towards the end, and much to the surprise of the anti-fascist groupings present, the court dismissed all the submitted evidence. For the short and simple reason, that it is ‘completely irrelevant whether the holocaust really did happen or did not happen. It is illegal to deny it in Germany , and that is all that counts in court.’ Close quote from TAZ. I will now return to the sentence with which I began this lecture ‘To think what is true, to sense what is beautiful and to want what is good, This implies the ability to identify and label lies the ability to identify and label the inhumane the the ability to identity and label injustice It also implies character traits, which is of particular importance in our age. The knowledge of our immortality, of steadfastness and incorruptability. With such character we might be able to shape a world for the many children who were up here earlier today. A world in which we are allowed to speak the truth without punishment.